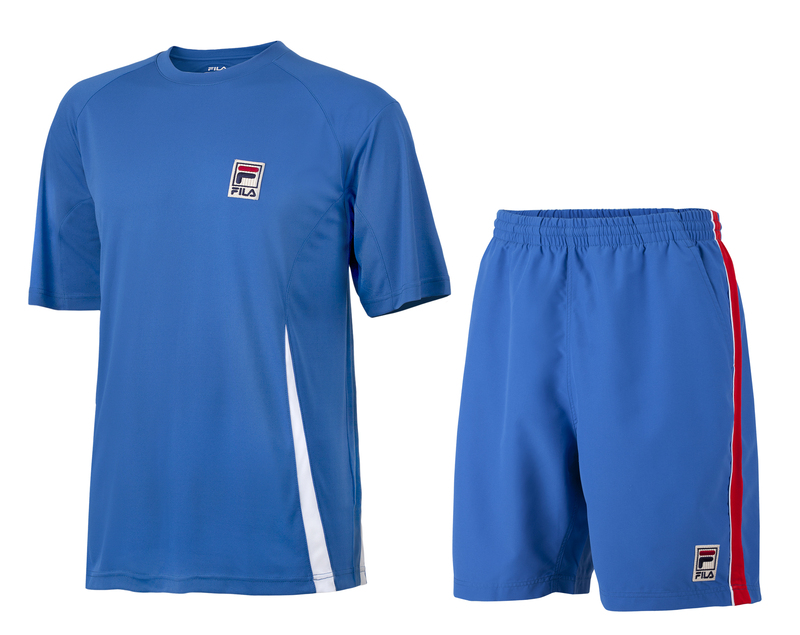 Fila announced today the debut of a special patriotic performance tennis apparel collection to be worn exclusively by Fila athletes on the courts of the All England Lawn Tennis and Croquet Club (All England Club) during the 2012 London Games. Each athlete will wear a unique design in either his or her national colors or those of their favorite national sports team. 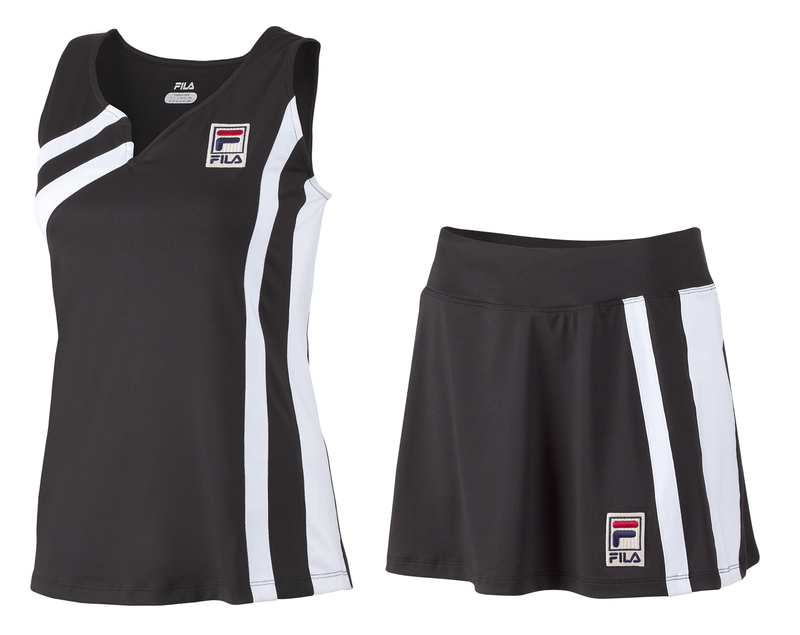 Fila’s new collection once again breaks new ground in the world of tennis apparel. We are thrilled that our athletes will play for their countries in a collection designed exclusively for each of them. 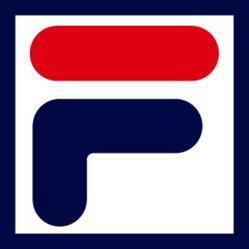 Fila announced today the debut of a special patriotic performance tennis apparel collection to be worn exclusively by Fila athletes on the courts of the All England Lawn Tennis and Croquet Club (All England Club) during the 2012 London Games. Each athlete will wear a unique design in either his or her national colors or those of their favorite national sports team. 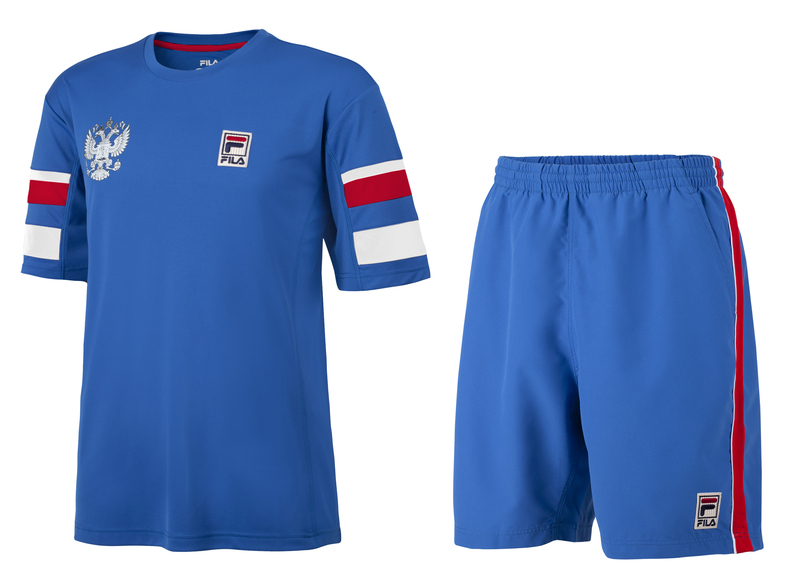 In honor of the brand’s rich history in tennis and in keeping with the deep national pride inspired by the games, Fila’s new collection once again breaks new ground in the world of tennis apparel. The collection consists of unique designs of men’s and women’s performance tennis apparel for eight different countries. Top ranked Serbian Janko Tipsarevic will wear a performance crew that Fila’s design team developed for his Davis Cup matches, and his fellow countrywoman Jelena Jankovic will wear a dress that she will also wear for Fed Cup play. The looks for both athletes are in the color combinations of the Serbian flag (red, royal and white) and don a patch of the Serbian flag on the back. Jelena’s dress features asymmetrical cutouts in the back and semi-circular taping in contrast colors. The front chest of each garment includes a patch of the crest from the Serbian flag. 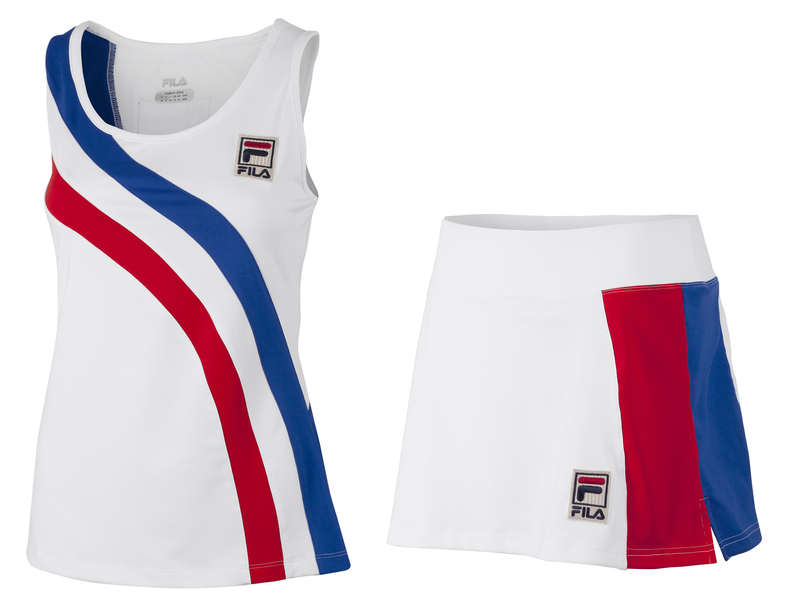 Fila’s apparel for the Russian team members include a v-neck short sleeve shirt and matching skort for Vera Zvonareva in turkish sea (royal blue) with vertical stripe accents (white and red) on the side of the skirt or a solid short. Both men’s and women’s looks have the coat of arms of the Russian Federation on the chest in white and a patch of the Russian flag on the back nape of the neck. The men’s crew will be worn by Dmitry Tursunov is solid turkish sea with red and white horizontal accents on the sleeves. The men’s short has white and red vertical taping down the side seam. 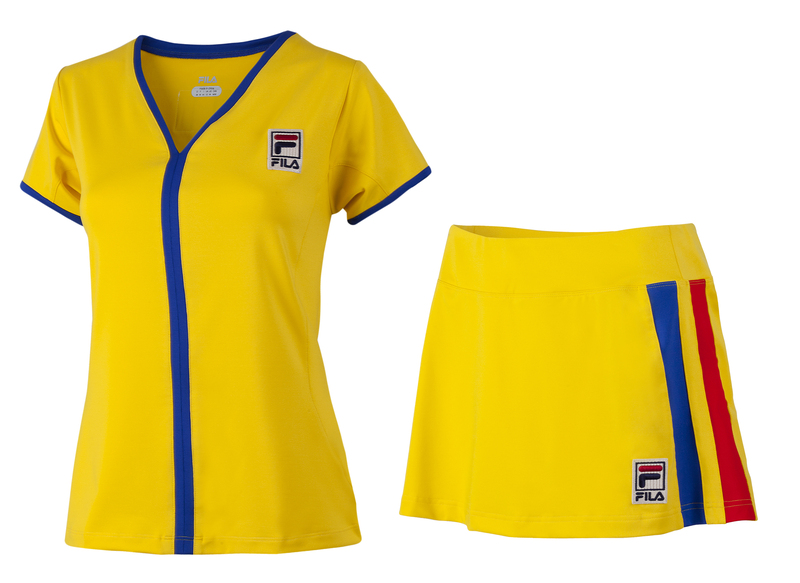 Fila’s female player from Romania, Irina Begu, will wear a lemon yellow based v-neck crew and skort with accents in colors red and royal from the Romanian flag. The top has contrast color on the sleeve and around the v-neck which continues straight from the end of the v to the bottom seam of the top. The skort has two vertical strips at the side of the hip, one in royal and the other red. A patch of the Romanian flag will be on the back nape of the neck. Fila’s athletes from Kazakhstan will also wear apparel in color combinations of their nation’s flag. The men’s crew is surf the web (aqua) with lemon yellow and white horizontal stripe across the chest that continues over the left sleeve. The matching short includes a white vertical stripe on the side seams. The women’s outfit includes a v-neck racerback tank and skirt in aqua with white and yellow athletic taping that starts from the right under arm and then separates mid chest to meet the bottom seam (yellow) and side seam of the top strap tank. The yellow and white horizontal taping is also included the back just below the racerback. The men’s crew and women’s tank include the patch of the Kazakhstan flag. 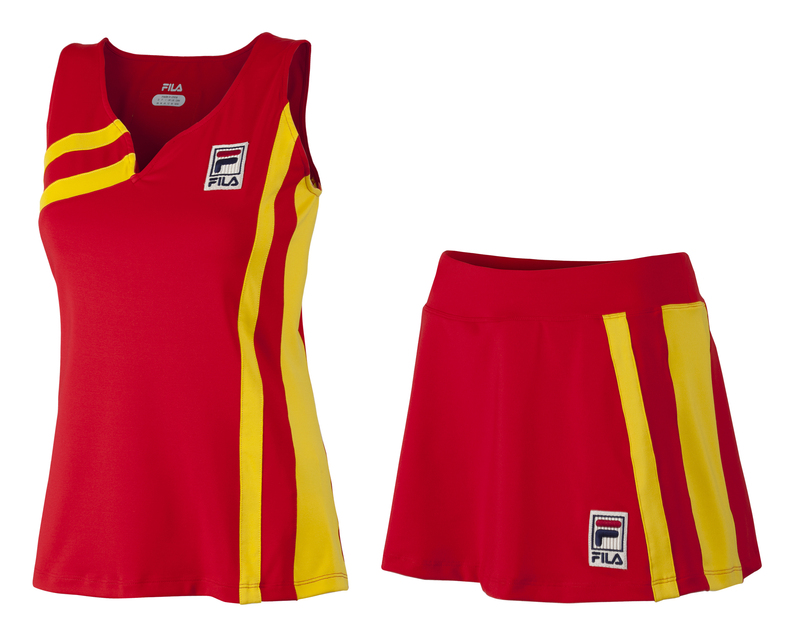 The outfit for Fila’s athlete from Spain includes a full coverage scoop neck tank with a v-notch in the center of the scoop and skort in the colors of the Spanish flag. The tank is red with lemon as the highlight color. Two athletic stripes in yellow (different widths) go down the left side of the tank and continue to the hem of the skort. Two additional stripes start from the v-notch in the neck and continue diagonally to the side seam and then the thicker stripe continues to the hem. For Fila’s athletes from Italy & New Zealand, the design team took a decidedly different approach and chose to honor the athlete’s favorite sports teams in soccer and rugby, respectively. Andreas Seppi will wear a surf the web and white crew and short which is the same color as the Italian National Soccer team. Fila’s athlete from New Zealand will sport a black and white tank and skort combination for the All Blacks Rugby team. The back of each top in the collection includes a patch of each nation’s flag. The limited edition collection will be available exclusively on fila.com in the U.S. market and prices range from $70-$130.